The diagram shows the beneficial magnetic distortion as color-shaded regions on the smooth doughnut-shaped surface of the KSTAR plasma, together with the external 3D field coils in blue and red used to generate the distortion. Image Credit: Jong-Kyu Park, Princeton Plasma Physics Lab. Click image for the largest view. Here’s the tokamak problem. Its how to lessen or eliminate a common instability that occurs in the plasma called edge localized modes (ELMs). Just as the sun releases enormous bursts of energy in the form of solar flares, so flare-like bursts of ELMs can slam into the walls of doughnut-shaped tokamaks that house fusion reactions, potentially damaging the walls of the reactor. The basic problem is the tokamak has a huge surface real estate issue. 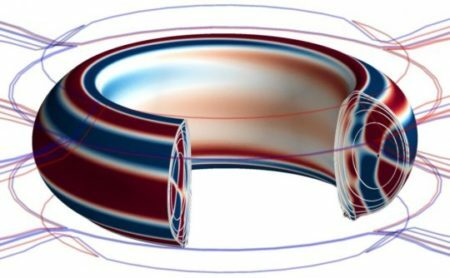 To control these bursts, scientists disturb the plasma with small magnetic ripples called resonant magnetic perturbations (RMPs) that distort the smooth, doughnut shape of the plasma – releasing excess pressure that lessens or prevents ELMs from occurring. The hard part is producing just the right amount of this 3D distortion to eliminate the ELMs without triggering other instabilities and releasing too much energy that, in the worst case, can lead to a major disruption that terminates the plasma. Tens of billions of dollars in, its real hard to give up on an amazingly complex and unwieldy device that may well work someday. But tokamaks are going to be stunningly expensive. One worries they’ll be so expensive and costly to decommission that everything thing else will seem cheap. They may well be forced on the rate paying public.